We need to take back control of our NHS from the unelected technocrats and their health industry friends – and politicians brave enough to say so. What about the Labour party? As the Labour leadership campaign enters its final week, the Tories are getting on with the job of dismantling the NHS. On Wednesday Shadow Health Secretary Diane Abbott warned fellow MPs the government was “planning for disaster”, in an opposition day debate on drastic plans to cut frontline NHS services, so-called ‘Sustainability and Transformation Plans’ (STPs). Abbott slammed the secretive plans, saying they were being “presented as a drive towards medical prevention” of ill health, but the planned savings “could only be achieved by preventing access to the NHS”. And she warned the plans were a “stalking horse” for privatisation, praising “the work of organisations such as openDemocracy and 38 Degrees” for ensuring that “the picture of what STPs will mean is becoming clearer”. NHS boss Simon Stevens has warned local NHS managers that if they don’t promise the required level of frontline cuts in their STP plans, they face their organisations being put into ‘special measures’ and taken over by more compliant leaders. Too slowly, the media are waking up to the fact that the £22bn a year funding shortfall accepted by NHS boss Simon Stevens at the behest of his Tory bosses is going to mean eye-watering cuts to hospital services on the ground. Chris Hopson of NHS Providers admits a ‘glut’ of hospitals could close. Stephen Dalton of the NHS Confederation defends the plans, saying they “are not about cuts” and suggesting local NHS managers and politicians will “do their best to reflect local needs and will want the wider community to be involved in the conversation”. But – as yesterday’s Commons debate made clear – that’s not what’s happening. Cheshire & Merseyside ‘STP’ bosses tell NHS campaigners that they can only see the plan and be consulted on it “when the plan has been agreed” by NHS England, and that STP planning meetings “are not held in public and the notes from these meetings are not published”. NHS campaigners from Bristol to Brighton, Cumbria to Gloucestershire have had their own requests for information similarly rebuffed. And when Shrewsbury & Telford NHS bosses published their STP plan they were rapped on the knuckles by NHS England’s regional director who told them that STPs “should not go to Board meetings… they are not meant to be published at all…they are highly political and highly contentious”. So if NHS leaders are not having any meaningful conversation with the public to help them ‘transform’ the NHS – who are they talking and listening to? This summer, the self-styled ‘soft left’ have been busy reassuring Labour members that if they kick out Jeremy Corbyn, there’s absolutely no risk of another takeover by Blairite MPs. Blairism is so over, they opine, and everyone is a socialist now. Even Tony Blair himself chipped in to suggest that Blairism had ‘had its day’. Paul Mason has warned us that on the contrary, many prominent right wing Labour figures have only gone quiet because they are biding their time before launching a renewed counter-attack. Probably true. But there’s another side to this story, too. In this post-democratic age, being an MP isn’t really where it’s at. This is certainly the case in the NHS, where the 2012 Act removed any legal duty on the Secretary of State to secure or provide comprehensive healthcare. Now, our MPs don’t even have the right to know, for example, what contracts disgraced contractor G4S holds with the NHS. Instead, decisions about running, cutting or privatising NHS services are handed over to the technocrats, whilst Jeremy Hunt stays out of sight. (The Health Secretary didn’t even bother turning up to yesterday’s Commons health debate!). So who are these technocrats shaping our post-democratic NHS? An astonishing number of them worked as advisors to Tony Blair. In charge is NHS boss Simon Stevens, formerly Vice President of US private health giant UnitedHealth. As special advisor to former Health Secretary Alan Milburn until 2001 and then directly to Tony Blair from 2001 to 2004 Stevens was the architect of the 2000 NHS Plan which re-established the ‘internal market’, and the ‘concordat’ which opened the door to private health firms running NHS services. Under him, running the Sustainability and Transformation Programme is Michael MacDonnell – who succeeded Stevens as an advisor to Blair in his Delivery Unit. MacDonnell recently boasted of the ‘enormous opportunity’ the STP plans offer the private sector. A slimmed down, reconfigured frontline less focused on hospitals, and overseen by management-heavy restrictions on referrals and staffing, are clearly appealing to the private firms which already dominate the ‘home care’ market and NHS ‘management expertise’. The ‘efficiency savings’ across the NHS (labelled as ‘unrealistic’ and ‘damaging’ by the Public Accounts Committee) have been driven by NHS Improvement’s predecessor, Monitor for several years. From 2011 Monitor was headed by David Bennett, who moved from McKinsey to work as head of Blair’s Strategy Unit from 2005-7. Then we have the consultants. There are the familiar faces of PWC and McKinsey, involved in helping write the fantasy plans at local level. But there are less familiar faces too. Kieran Brett – another former Blair advisor – now heads up ‘STP consultancy’ at iMPower. Brett was recently in the spotlight when his firm held a rather lavish reception to promote their services to local NHS bosses – with the star ‘draw’ being the chance to schmooze with Brett’s former-colleague-turned-STP-boss, Michael MacDonnell. The connection is closer than that - Brett, MacDonnell and David Bennett also founded a think tank together. OurNHS’s FOI requests have exposed that another consultancy advising STP bosses is GE Finnamore – the health consultancy recently bought up by General Electric. GE Finnamore works with yet more former Blair era figures including ex-Blair health advisor Paul Corrigan, who played a key role in forcing hospitals like Mid-Staffs to rush to adopt Blair’s flagship NHS policy of becoming ‘business-like’ foundation trusts, with disastrous results. Another Finnamore associate is Simon Stevens’ former colleague at the Department of Health, Sir Neil MacKay. MacKay founded the NHS’s specialist privatisation unit, recently closed down after a string of disastrous collapses, from Hinchingbrooke to the UnitingCare contract. He’s now running the ‘Success Regime’ (ie, special measures) in Cumbria’s NHS. Such figures were key in the setting up of the ludicrously wasteful NHS ‘market’ from 2000 onwards, introducing the flawed foundation trust model, wrecking GP contracts and out of hours services, pathology, and more. And at least two Blairite peers – Lords Warner and Carter – also continue to be actively involved in promoting NHS cuts and privatisation. Owen Smith, in his main campaign NHS speech, suggested New Labour had been “naïve” about the extent to which its NHS policies opened the door to further privatisation. But the ongoing survival and influence of these men (and the lucrative post-politics careers of former New Labour health secretaries like Alan Milburn and Patricia Hewitt) suggests that they knew exactly what they were doing – or have adapted very happily to their outcomes, nonetheless. This summer, the campaign to unseat Corbyn brought to light still others who’ve done well from a health market in which they can flog consultancy, research, and patient ‘segmentation’. Folks like Reg Race, former Labour MP and donor, who is the man behind the anti-Corbyn ‘Saving Labour’ project. Race’s ‘Quality Health’ firm made its fortune from supplying the survey systems set up by Labour health ministers in 2003 to facilitate the newly ‘marketised’ NHS. And Chris Powell – chair of the Portland Communications agency that has been implicated in some of the moves to oust Corbyn. Powell currently chairs Dr Foster, the outfit that pioneered a consumerist approach to repackaging and selling NHS data and was rewarded with a highly controversial sweetheart deal by New Labour health ministers. Then there’s Joe McCrea – who registered ‘Angela 4 Leader’ a few days before the anti-Corbyn ‘coup’ started. McCrea started out as yet another health special advisor during the Blair government, working alongside Simon Stevens. He now earns much of his income from consulting on the ever-expanding array of NHS digital/data initiatives. Most notably, perhaps, a key donor to the new anti-Corbyn group ‘Labour Tomorrow’ is one Martin Taylor. Taylor was revealed in 2015 as the hedge fund manager who had had made substantial donations to Labour throughout 2013 and 2014, and who had had at least one private meeting with Ed Miliband, on 3rd July 2013. It was also revealed that the hedge fund he managed through his asset management firm, the Nevsky Fund, had $15million holdings in key global health privatiser UnitedHealth, acquired in 2014. A spokesperson for Mr Taylor has contacted us to say that Mr Taylor did not discuss the NHS with Ed Miliband. On 1st July 2013 Miliband had delighted NHS campaigners by promising Labour would “reinstate the Secretary of State’s duty to provide comprehensive healthcare”. But this unequivocal commitment was never heard of again from Miliband, who instead swung swiftly rightwards on health policy: in his next major NHS speech in early 2014 he endorsed pro-market policies like personal health budgets. A major part of Corbyn’s appeal was that he promises a fresh start from this kind of elitist, corporate-influenced, revolving door politics. He has promised to put an end to the system where policy is shaped by, at best, ultra-establishment figures with well paid jobs within the current marketised system; and at worst, by lobbyists with interests in privatised healthcare. Corbyn promised instead that Labour would be a party of social movements and internal party democracy. In his first two years of the last Labour government, Blair had been forced to pursue anti-market policies in the NHS by party conference. But in 2000 conference was neutered, and policy shifted sharply rightwards. Although conference has strongly voted against NHS privatisation when given a chance, such as in 2012, such votes were essentially ignored by the front bench, and in 2013 and 2014 the party machinery nobbled similar left-wing motions. Instead, Labour’s health policy going into 2015 was heavily shaped by former SDP man Sir John Oldham (now working with private STP consultants GE Finnamore), who’d been hand-picked by the then Shadow Health Secretary Andy Burnham in 2013 to write Labour’s ‘Independent’ health policy commission report, the one which formed the basis of Labour’s manifesto policy. “No he wasn’t a Labour party member” and nor were any of the other policy Commission members, the Health Services Journal confirmed at the time. And of course ordinary Labour party members or NHS campaigners had no say in their appointment. Oldham’s report emphasised ‘self-care’ and the possibility of merging health with social care in a way that didn’t protect comprehensive, free healthcare. No wonder then that Corbyn’s fresh start was widely appealing to both party members and NHS campaigners. Straight-talking politics, or ‘crafting a narrative’? Campaigners were disappointed to find little sign of a break with the past by Heidi Alexander. “I never saw Alexander show any evidence of enthusiasm for engaging with campaigners once she became shadow health spokesperson”, comments Dr John Lister, founding member of Keep Our NHS Public and umbrella group Health Campaigns Together. Alexander was reluctant to criticise Stevens’ NHS plans, including the Sustainability and Transformation Plans. This was despite the fact that a high-level coalition of leading NHS campaigners and independent experts like Professor Allyson Pollock had managed to meet her and warn her strongly that these meant drastic cuts and more privatisation. Faced by Labour health team silence – with the honourable exception of Justin Madders – on both privatisation and the fantasising behind the planned cuts NHS campaigners organised amongst themselves to bring these plans to public attention. They approached Corbyn and McDonnell, and found them willing to engage with those outside the usual ‘business as usual’ interests. But for Alexander, that was somehow evidence that the new Labour leadership was “inept” – as was Corbyn and McDonnell visiting junior doctors’ picket lines and supporting the NHS Bill designed by experts and campaigners to end the NHS market and restore comprehensive healthcare. All of these actions were cited by Alexander as the supposed final straw that prompted her to become the first person to resign from Corbyn’s shadow cabinet in the post-Brexit ‘coup’. She has since become Smith’s campaign manager - joining pharma and private healthcare lobbyist John Lehal who was appointed operational head of Smith's campaign, and former lobbyist for pharma firm AstraZeneca at Finsbury, Will Tanner, who was appointed Smith's head of communications. And what of that campaign? 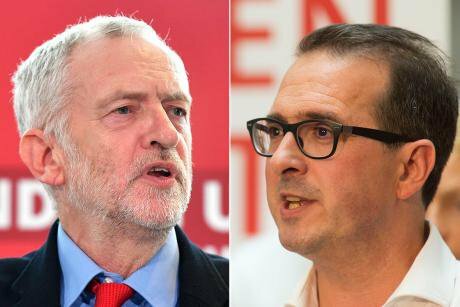 At times it has seemed as if there’s little to separate Corbyn and Smith on the NHS. Both have issued welcome pledges to address privatisation, reverse nurse training cuts, and increase spending on the NHS. Corbyn has gone a little further in pledging to review current contracts and commit to no new PFI. His language on reversing privatisation is somewhat more credible than Owen Smith’s ‘100% publicly owned’ (soon subtly shifted to ‘if possible’). Corbyn’s longstanding support for the NHS Reinstatement Bill, now being re-introduced by Labour MP Margaret Greenwood, has already won him many friends amongst NHS campaigners – including both Allyson Pollock and Lord Owen. His shadow health secretary Abbott has criticised the “wilful self-delusion” behind current NHS ‘efficiency’ plans in far stronger terms than her predecessor Alexander. Both Corbyn and Abbott have at last begun to talk about how privatisation / marketisation of healthcare isn’t just wrong – it’s expensive, and requires a vast bureaucracy. Meanwhile Smith’s background as a Pfizer lobbyist (something he rather implausibly denies) has given Corbyn’s team an overdue opportunity to look at the elephant in the waiting room, big pharma. But the real difference between Corbyn and the ‘business as usual’ crowd that seek to ‘reclaim’ Labour, is not as yet so much in policy detail, but in their attitude to democracy, and how they’ll develop that policy. For too many politicians, NHS campaigners and independent experts have made nice decoration for election campaigns, but their actual knowledge of what things are like on the ground has been of little interest. Instead, unaccountable elites are allowed to dominate, in a way that increases the disconnect between voters and democracy. This is exactly the process going on with Sustainability and Transformation Plans. It is the chance to change this which people feel is most valuable about Corbyn. For the NHS, straight talking and honest politics are long overdue. 16/9/2106, 9.50pm: This article has been amended to reflect the fact that Martin Taylor’s asset management firm manages a hedge fund, not a private equity fund as originally stated. Mr Taylor’s representatives have also asked us to add that the funds’ investments in United Health were made in 2014, and that Mr Taylor states he did not discuss the NHS with Ed Miliband.